If you’ve ever wondered who deserves a big thank you and the acknowledgment for inventing chocolate chips, it’s Ruth Graves Wakefield. There are several similar versions of the story regarding just how these delicious chips became a staple in the kitchen of home cooks and professional chefs. According to the most popular version of the story, in 1937, an experienced cook by the name of Ruth Wakefield was preparing to make a batch of cookies when she realized she was out of baker’s chocolate. As a substitute for the baker’s chocolate, she decided to chop a semi-sweet chocolate bar into chunks. The chocolate chips did not melt like the bakers chocolate did so the cookie she baked was slightly different from its original version. The cookies made with chocolate chunks were a huge success. As the story goes, in 1939 Ms. Wakefield worked out an arrangement with Nestle to add her recipe to the chocolate bars package in exchange for a lifetime supply of chocolate. There are some variations in the story regarding the exact arrangement that was made but this version is the most popular. Nestle included a small chopping tool with the chocolate bars so that cooks could chop the bar into chunks and add them to recipes. In 1941, Nestle and a few other companies made life a little easier for cooks by creating and selling chocolate chips or “morsel”. The idea that Ruth Wakefield had has led to the creation of numerous flavors of chips. Today, you can diversify recipes in many ways uses flavored chips. Milk chocolate chips are the sweetest chocolate chip. Typically, they are not used in baking because they melt quickly and can affect the texture and consistency of the final product. The milk chocolate variety is most often enjoyed as a snack, as an addition to a snack mix or sprinkled over ice cream. You may want to buy bulk chocolate chips of the semisweet variety if you want chips to use in baking. These chips have a low sugar content which makes them more conducive to baking. Cooks can control the sweetness of a dessert that contains semisweet chips. These chips have an intense, rich chocolate flavor due to the fact that they contain about 75% cocoa. Semisweet chips retain their shape during the baking process. There’s a very slight variation in the flavor of bittersweet chips and semisweet chips. Bittersweet chips have a higher level of chocolate liquor. Chocolate liquor is the liquid from the cocoa bean. There are other flavors of chips that can be used to enhance baked goods or enjoyed as a snack. Butterscotch, peanut butter, yogurt chips and mint chocolate chips and white chocolate chips are some of the other flavorful options that can be used to create decadent, delicious and fun desserts. When you’re searching for food products that will accommodate specific dietary restrictions, it’s essential that you read labels carefully. Good quality dark chocolate or semisweet chocolate is dairy free. These can be eaten as a snack if you appreciate the intensity of the flavor. They can also be added to recipes that are compatible with a dairy-free diet. 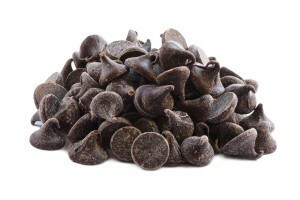 There is some variation in the number of calories in chocolate chips depending on what type of chip it is. A 30g serving of the milk chocolate type has 160 calories. That same size serving of semisweet chips has 180 calories. Bittersweet chips have approximately the same calorie content as semisweet chips. A 40g serving of white chocolate chips contains 200 calories. If you choose to use yogurt chips in your recipes, their calorie count is 255 calories per 30 g serving. Chocolate chips and yogurt chips can be used in many ways to add flavor and texture to numerous recipes. If you plan to do a lot of baking, you will find that buying chocolate chips wholesale is easy on the budget. Also, when you buy bulk chocolate chips, you’ll be less likely to find yourself in the same situation Ruth Wakefield found herself in when she needed chocolate pieces and didn’t have any. Yogurt chips, as well as chocolate pieces, can be included in cookie recipes. Chocolate chip bread is delicious. Banana bread, pumpkin bread and zucchini bread can all be made more delicious with the addition of these intensely flavored chips. You can easily find an extensive number of healthy dessert recipes that include small pieces of chocolate. You don’t have to be a baker to buy chocolate chips or yogurt chips. These flavorful tidbits of goodness can be tossed into a trail mix or snack mix. By adding the dark chocolate type to trail mix, you will gain additional health benefits that the dark chocolate adds to the mix. You can make a bowl of ice cream or cup of yogurt a more sophisticated and flavorful treat by sprinkling dark chocolate pieces over it. If you happen to among those who find a bowl of oatmeal a rather mundane, you can make your next bowl of oatmeal more flavorful and exciting by adding tidbits of chocolate to it. You can include chocolate chips in your favorite hot cocoa recipe to take it to a higher level of decadence. If you’re a lover of chocolate, you’ll be delighted to know that you can sneak some chocolate into recipes in some unexpected ways. You can elevate the deliciousness of main source meal with chocolate chips. They can be added to a homemade chili recipe or stirred into spaghetti sauce to add an unexpected, delightful flavor.